Want a snapshot of all the major events, big news and big names in America this week? What about a potential cure for HIV? Or perhaps a new President? Read on if you’re enticed. 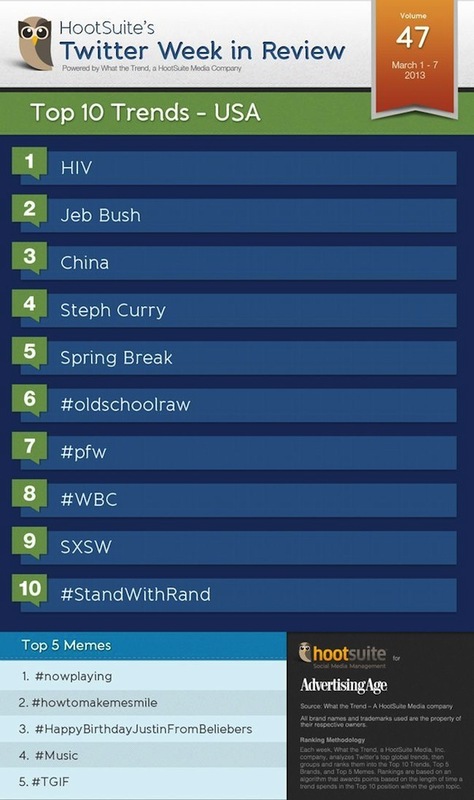 There is no surprise why number one on our US Twitter charts this week is trending. Scientists announced this week that a Mississippi baby born with HIV appears to have been cured of the virus. Now two and a half years old, the child has been off medication for a year with no signs of infection. This miracle happened because the baby was treated with an adult-sized dosage of medication immediately after birth for over a year, which scientists believe stopped the development of infection. Although the HIV could start developing at some point in the child’s life, sophisticated tests uncovered only mere traces of the virus’ genetic material. If the child remains healthy and HIV-free, it would mark the world’s second reported cure. What could this mean for AIDS-plagued African countries where babies are born with the virus? Some specialists are excited that this could help slow the virus’ spread across developing countries with proper medication and detection. On the other side of the coin, other specialists tred much more cautiously when saying they’ve potentially found a “functional cure.” Dr. David Margolis, an HIV expert and professor of medicine at the University of North Carolina at Chapel Hill says the way the news exploded hope around the world is truly unfortunate. According to him, this is likely a one-off case and in actuality we are a long way off from a cure. Spreading hope for a cure to a major epidemic is a double edged sword. President Bush Sr., President George W. Bush… and President Jeb Bush? Brother of George W. Bush and the first and only Republican to serve two full four year terms (1999 to 2007) as Governor of Florida, Jeb Bush has been trending in news and social recently. Long resisting pressure from his Republican supporters to run for president, now the former Florida governor has suggested that he’s at open to the idea. This marks a potential political shift as Republicans struggle to rebound after President Barack Obama’s re-election. ‘I’m not saying yes. I’m just not saying no,’ Bush told NBC News earlier this week (see video below). Although nothing stood out in Twitter in particular, China was trending in the news and social for a number of reasons this past week. One major reason for discussion is China’s extremely wealthy politicians and rising concern that they are failing to acknowledge and support their growing middle class. According to the New Yorker, the number of legislators who are on the list of China’s richest people grew seventeen per cent, from seventy-five to ninety, each of whom have an average wealth of $1.1 billion. In comparison to US legislators who have a similar wealth divide problem, there are no billionaires in US Congress at any level. 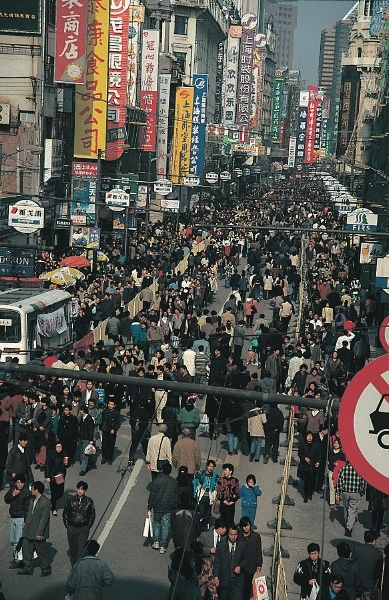 The Chinese Communist Party promised that by 2020 their would be a strong “New Middle-Propertied Stratum” aka middle class. In Beijing this week and next, more than five thousand members of China’s legislature and advisory bodies are meeting to enact the will of the people. Likewise, China is trending because of its and Russia’s role in dealing with North Korean nuclear threats on South Korea and US. Previously a major aid supporter of North Korea, China is backing off support and urging them to calm the already tense border situation. “China should consider abandoning North Korea,” wrote Deng Yuwen, the deputy editor of Study Times, the journal of the Central Party School of China’s Communist Party. “A nuclear-armed North Korea might put China on the losing side of any confrontation on the Korean peninsula, and North Korea’s ruling elite simply won’t let the regime reform.” It sounds like China has a lot of important decisions to make in the next couple of weeks. On a lighter note, the basketball world was absolutely buzzing this week because of NBA basketball player Stephen Curry and his breakout season with the Golden State Warriors. Curry made headlines last week for scoring an unbelievable 54 points in one game on 28 shots. Carrying the weight of the entire team on his shoulders, fans and reporters suggest his team needs to rise to Curry’s occasion. Paris Fashion Week, arguably the most influential global fashion events of the main fashion capitals – New York, Milan and Tokyo, started on February 26 and continued into this week. The #pfw discussion made its way overseas into the US where Tweeters talked clothing and fashion trends for the spring/summer and even fall collections. Recently en par with the runway shows themselves, are the onslaught of street fashionistas and bloggers. Parisians sure know how to dress and work it – whether on the catwalk or sidewalk. Move aside fabrics, leather is making a bigger statement than ever this season. PS black is back. 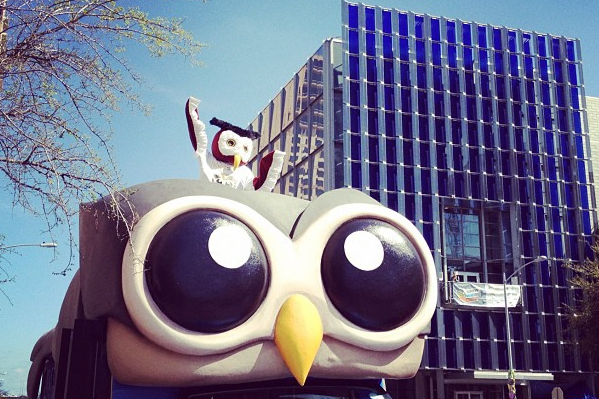 HootSuite’s famous #HootBus is heading down to SXSW! See you there? This magical place is where startups make or break it. It’s where bands and films play to become megastars or mega-flops. And it’s where seasoned startup vets – like us – go to to mentor, lead, teach and party with our interactive peers. Beginning this weekend is the film, interactive and music festival and conference extravaganza, called South by Southwest (SXSW). Taking place every spring, businesses, brands, bands and creatives gather from all over North America to meet in Austin, Texas, United States. SXSW began in 1987 and has continued to grow in size and importance every year. This year, the festival will run from March 8 until March 17. And guess what? HootSuite is down there now at SXSW interactive with our famous #Hootbus! Want to meet up with us down south? Check out all the cool things we’re doing at SX! Thanks for reading ~ Check out all the crazy world news that is International Trends of the Week this week! Sam is a Hootsuite Copywriter who specializes in Customer Programs Content. From inspirational customer success stories to powerful case studies, Sam knows our customers like no other.